Background Owing to the low therapeutic index of barbiturates, benzodiazepines (BZDs) became popular in this country and worldwide many decades ago for a wide range of conditions. Because of an increased understanding of pharmacology and physiology, the mechanisms of action of many BZDs are now largely understood, and BZDs of varying potency and duration of action have been developed and marketed. Although BZDs have many therapeutic roles and BZD-mediated effects are typically well tolerated in the general population, side effects and toxicity can result in morbidity and mortality for some patients. The elderly; certain subpopulations of patients with lung, liver, or kidney dysfunction; and patients on other classes of medication are especially prone to toxicity. Methods This review details the present knowledge about BZD mechanisms of action, drug profiles, clinical actions, and potential side effects. In addition, this review describes numerous types of BZD-mediated central nervous system effects. Conclusion For any patient taking a BZD, the prescribing physician must carefully evaluate the risks and benefits, and higher-risk patients require careful considerations. Clinically appropriate use of BZDs requires prudence and the understanding of pharmacology. Benzodiazepines (BZDs) are one of the most widely prescribed pharmacologic agents in the United States (more than 112 million prescriptions in 2007).1 BZDs are used for numerous indications, including anxiety, insomnia, muscle relaxation, relief from spasticity caused by central nervous system pathology, and epilepsy. BZDs are also used intraoperatively because of their amnesic and anxiolytic properties. However, these properties become undesired side effects in nearly all other clinical instances. BZDs act as positive allosteric modulators on the gamma amino butyric acid (GABA)-A receptor. The GABA-A receptor is a ligand-gated chloride-selective ion channel. GABA is the most common neurotransmitter in the central nervous system, found in high concentrations in the cortex and limbic system. GABA is inhibitory in nature and thus reduces the excitability of neurons. GABA produces a calming effect on the brain.2 The 3 GABA receptors are designated A, B, and C. This article focuses primarily on the GABA-A receptor, with which BZDs interact. Gamma amino butyric acid receptor with target sites. Adapted from http://ccforum.com/content/12/S3/S4/figure/F1. The pharmacokinetic properties of a drug determine its onset of action and the duration of its effect. Specifically, pharmacokinetics describes the absorption, distribution, metabolism, and excretion of a drug (ie, what the body does to the drug). Pharmacodynamics describes the responsiveness of receptors to a drug and the mechanism by which these effects occur (ie, what the drug does to the body). Individuals respond differently to the same drug, and often these different responses reflect the pharmacokinetics and/or pharmacodynamics among different patients. Preexisting disease processes and age-related changes affect elimination half-life, an especially important consideration when administering BZDs. Elimination half-life is the time necessary for plasma concentration of a drug to decrease to 50% during the elimination phase. Because elimination half-life is directly proportional to the volume of distribution and inversely proportional to its clearance, renal and hepatic disease (altered volume of distribution and/or clearance) affect elimination half-life. Elimination half-life does not reflect time to recovery from drug effects. Elimination half-life is an estimate of the time needed to reduce the drug concentration in the plasma by half. After about 5 elimination half-lives, a drug is nearly totally eliminated from the body. Therefore, drug accumulation is likely if dosing intervals are less than this period of time. BZDs and their metabolites are highly protein bound. They are widely distributed in the body and preferentially accumulate in lipid-rich areas such as the central nervous system and adipose tissue. As previously mentioned, the more lipophilic agents generally have the highest rates of absorption and fastest onset of clinical effects. Most BZDs are oxidatively metabolized by the cytochrome P450 enzymes (phase I), conjugated with glucuronide (phase II), and excreted almost entirely in the urine. Another way to characterize BZDs is by relative potency. The first BZDs were low to medium potency. 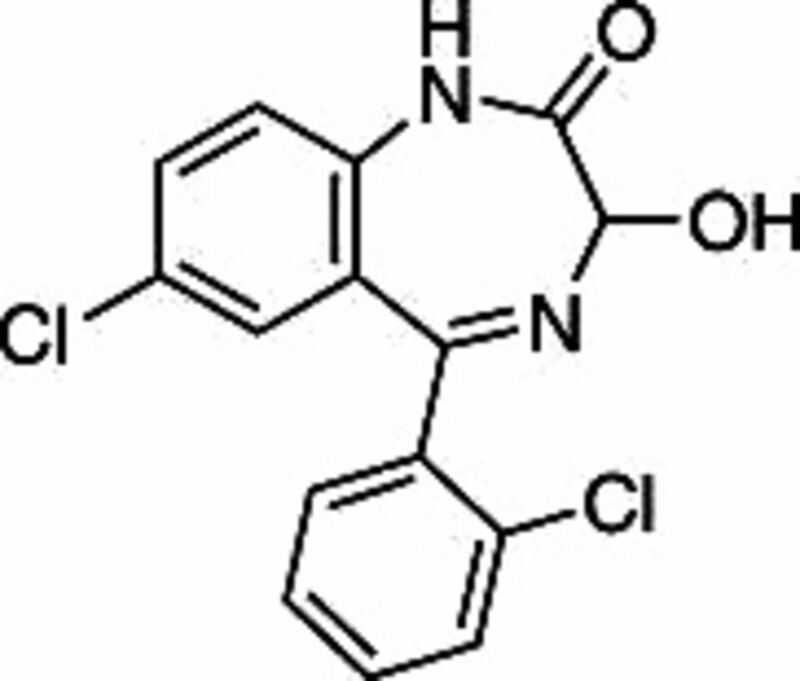 These include long-acting chlordiazepoxide, the first BZD discovered, as well as oxazepam and temazepam. Because of their effectiveness and relatively low toxicity, they became first-line agents for conditions such as insomnia and anxiety. Later, high-potency BZDs (alprazolam, lorazepam, and clonazepam) were discovered. These new drugs led to new indications for usage: as a treatment for panic disorders,10 as adjuncts to selective serotonin reuptake inhibitors for treatment of obsessive-compulsive disorder, and as adjuncts to antipsychotics for treatment of acute mania or agitation.11 The newer high-potency BZDs showed improved therapeutic effects as well as faster onset of action, making them the preferred BZDs for most applications. However, with increased potency comes an increase in the risk of undesired effects. Therefore, when prescribing drugs in this BZD group, clinicians must consider individual properties such as absorption, distribution, elimination half-life, and lipid solubility. 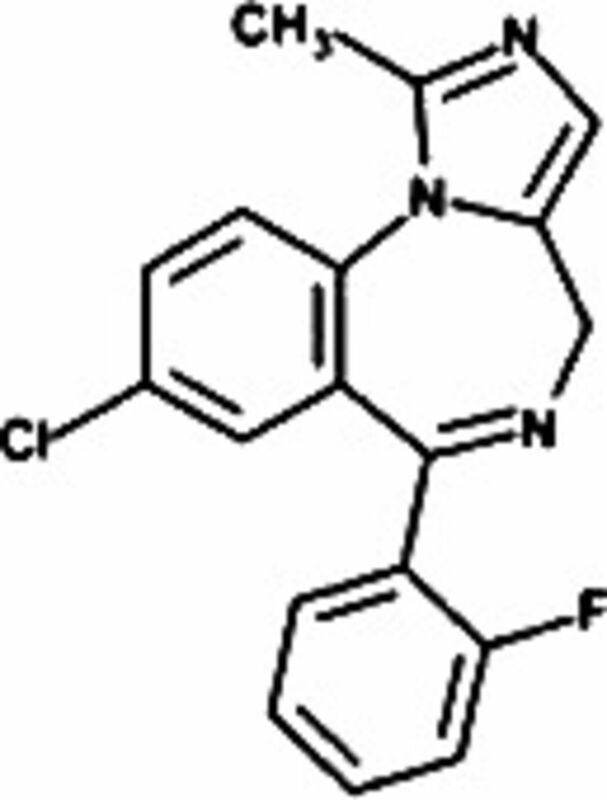 Alprazolam (Figure 2) is a short-acting high-potency BZD with an elimination half-life of 6-27 hours (Table). Alprazolam was first studied for use in panic disorders and was proven to be well tolerated and effective.12 Alprazolam is commonly prescribed for panic disorders and anxiety. The recommended dose for anxiety starts with 0.25-0.5 mg tablets, administered by mouth 3 times per day. The maximum recommended daily dose of alprazolam for anxiolysis should not exceed 4 mg. For panic disorders, the same tablet form and route of administration are recommended at a maximum recommended dose of 6-10 mg/d. A common issue with alprazolam is rebound anxiety that occurs with abrupt discontinuation because of the drug's short elimination half-life. 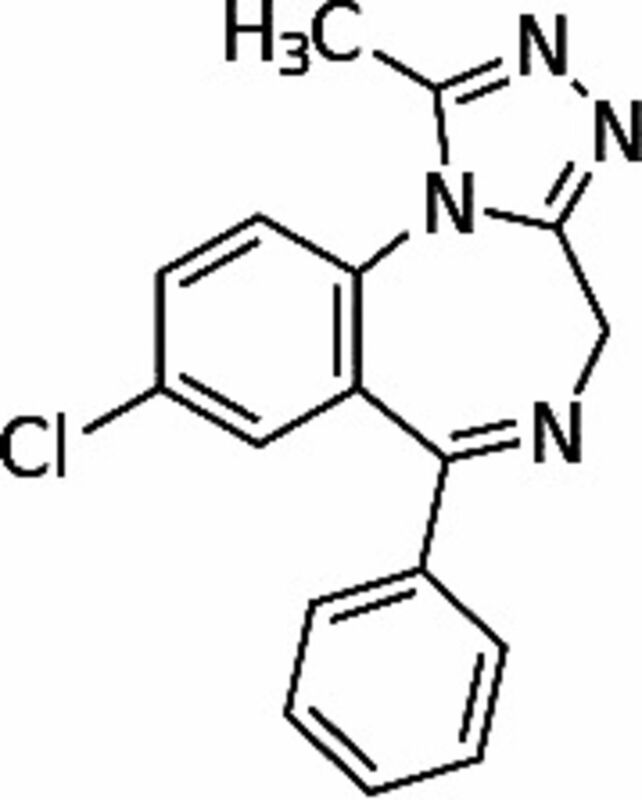 Clonazepam (Figure 3) was the second high-potency BZD discovered. Clonazepam behaves both as a GABA-A receptor agonist in a highly-potent, long-acting manner and also as a serotonin agonist.11 Clonazepam has anticonvulsant and anxiolytic effects. One study proved clonazepam to be at least as effective as lithium for treating acute mania.11 In association with serotonin reuptake blockers, clonazepam appears to accelerate treatment response to panic disorder.12 In another study, clonazepam proved as effective for treating panic disorders as alprazolam, and termination did not cause rebound anxiety symptoms13 because of clonazepam's long elimination half-life. Because clonazepam displays low lipid solubility, it is less likely to cause anterograde amnesia compared to the other high-potency BZDs. For example, clonazepam is half as lipid soluble as alprazolam, so patients' amnesic side effects are reduced. 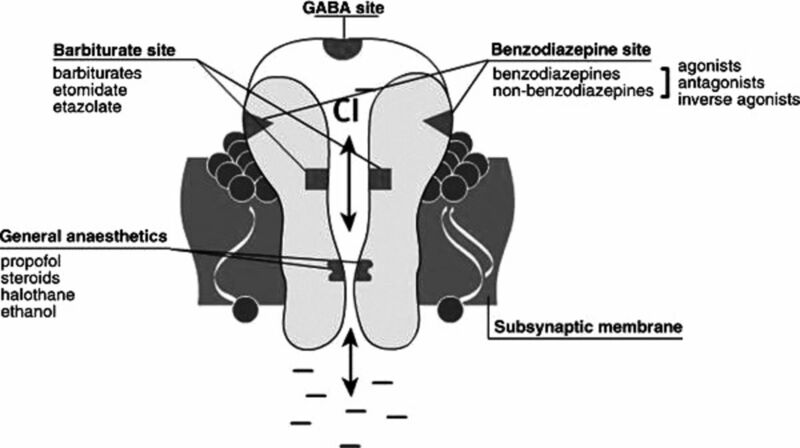 Clonazepam also has a relatively weaker binding affinity for GABA-A receptors than the other high-potency BZDs.11 Clonazepam, when used to treat panic disorders, should be initiated at a dose of 0.25 mg tablets, taken orally twice a day for 3 days, after which the dose should be increased to 0.5 mg tablets twice daily. The maximum daily dose should not exceed 1-4 mg. For treating seizure disorders, adults should start with 0.5 mg tablets taken orally 3 times per day. For this indication, the maximum daily dose should not exceed 20 mg. In the pediatric population, beginning with a dose of 0.01-0.03 mg/kg orally divided into 2 or 3 doses is recommended. The maximum dose in this population should not exceed 0.1-0.2 mg/kg in 3 doses. Lorazepam dosing largely depends on the indication. For alcohol withdrawal, clinicians prescribe 2 mg tablets orally every 6 hours for a total of 4 doses, followed by 1 mg every 6 hours for a total of 8 doses. For anxiolysis, dosing begins with 2-3 mg/d orally, divided into 3 doses per day. Maximum daily doses should not exceed 10 mg. The safety and effectiveness of oral forms have not been established in children under the age of 12. However, the same dosing recommendations for adults apply to children over the age of 12. For sedation, such as in the intensive care unit (ICU), 0.01-0.1 mg/kg/h intravenously is recommended. Recommended dosing of midazolam in the preoperative setting for sedation/anxiolysis is usually 1-5 mg intravenously up to 1 hour before surgery in otherwise healthy patients. In higher-risk patients, such as those older than 60 years or those with chronic obstructive pulmonary disease, no more than 3 mg intravenously up to 1 hour before surgery is recommended. In pediatric patients, the safety and efficacy of oral midazolam syrup has not been established for those under 6 months. Therefore, the oral syrup form should only be given to children older than 6 months, and up to 1 mg/kg (maximum dose 20 mg) administered orally is recommended for patients between 6 months and 6 years. Another option for pediatric preoperative sedation is intramuscular or intranasal delivery in a dose of 0.1-0.5 mg/kg (maximum dose 10 mg). Midazolam can also be given intravenously to pediatric patients at a maximum recommended total dose of 10 mg. Most children require substantially lower dosages to achieve desired effects. 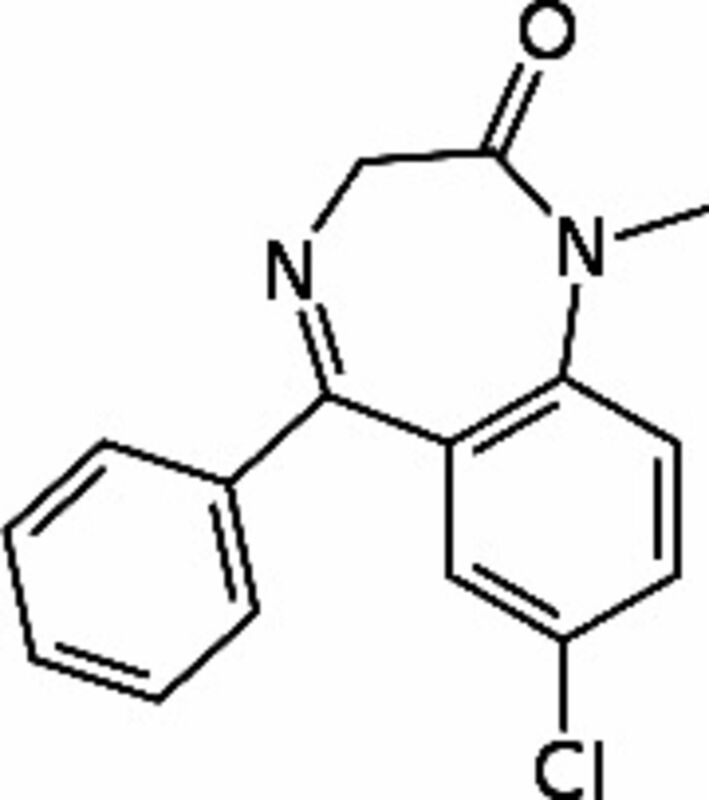 Diazepam (Figure 6) is a long-acting, medium-potency BZD that is used as an anticonvulsant and for anxiolysis, sedation, and myorelaxation. Diazepam, one of the most common BZDs used for anxiety,2 is available in intramuscular, intravenous, oral, and rectal gel forms. Diazepam interacts with equal affinity on all BZD-sensitive receptors in the central nervous system.7 Anxiolytic effects are seen at low doses because of diazepam's interaction with α2-containing receptors in the limbic system. 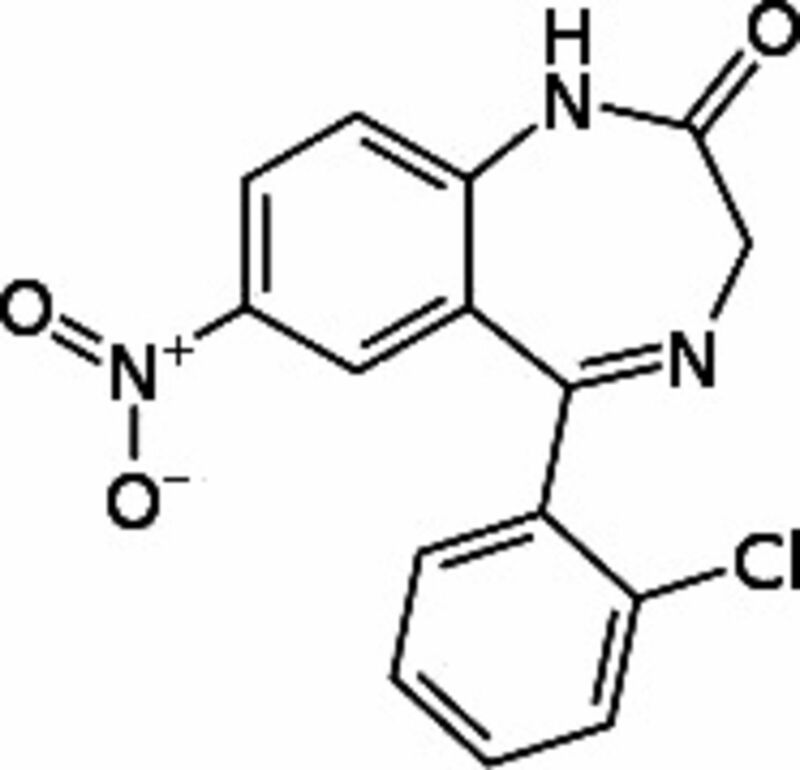 At higher doses, diazepam may provide myorelaxation in addition to anxiolysis; the myorelaxant effect is primarily mediated through α2-containing receptors in the spinal cord and motor neurons and to a lesser extent through interaction with α3-containing receptors.7 Of course, at higher doses, sedation and anterograde amnesia are also noted, but these effects are α1-mediated.22 Diazepam is unique in that its metabolism in the liver produces the active metabolites oxazepam, temazepam, and desmethyldiazepam, each of which exerts its own action. These metabolites and their actions account for diazepam's long elimination half-life, which increases approximately 1 hour for each year of age over 40 (eg, the diazepam elimination half-life in a 75-year-old would be approximately 75 hours). Thus, when prescribing this drug, clinicians must consider potential side effects related to active metabolite buildup, such as oversedation and anterograde amnesia. These side effects can be serious and long-lasting, especially in the elderly and in those with hepatic or renal dysfunction. For intravenous administration, diazepam must be prepared in solution with propylene glycol to be water soluble; this solution can cause pain on injection and, in some cases, thrombophlebitis. Diazepam, when used for anxiety, can be given as 2-10 mg orally, 2-4 times per day depending on symptom severity and the patient's age. Both intramuscular and intravenous forms are also available for anxiolysis and should be given in doses of 2-10 mg every 3-4 hours, depending on symptom severity and age considerations. As an adjunct to antiseizure therapy or for muscle relaxation, 2-10 mg orally up to 4 times per day is recommended. For status epilepticus, physicians initially administer 5-10 mg intravenously every 15 minutes up to a maximum dose of 30 mg. If needed, this dose may be repeated in 2-4 hours. Severe adverse effects may occur when BZDs are administered with other drugs such as opioids. In combination with opioids, cardiovascular and hemodynamic perturbations become more significant. Respiratory depressant effects on spontaneous ventilation are enhanced dramatically when opioids are used in combination with BZDs, and these effects are dose dependent. Respiratory depressant effects are also exaggerated in patients with chronic obstructive pulmonary disease. As people age, they experience a steady decline in the function of homeostatic mechanisms in the body, notably the central nervous system, liver, and kidneys. Research has demonstrated that as a function of aging, numerous central nervous system changes occur, including the death of neurons and their replacement with proliferating glial cells, decreases in intracellular enzymes, and reductions in dendritic synapses.23,24 The physiological changes of aging in the liver result in prolonged clearance of drugs. Decline in renal function begins after the age of 40 at a rate of approximately 1% per year, or a 1 mL/min/y decline in creatinine clearance.25 In the aggregate, these aging-related physiological changes are particularly important in terms of BZD accumulation. In general, there is increased sensitivity—including greater confusion and disorientation—to the effects of BZDs in the elderly compared with the young. This increased sensitivity is directly related to the accumulation of BZDs and related active metabolites. The elderly have subsequent increased intensity of BZD-mediated responses and the duration of BZD-mediated effects. Implicit memory is also impaired by BZDs, but not in the same manner as explicit memory. Numerous studies to assess BZD-induced memory impairment have all demonstrated a “differential time course” of BZD-induced impairments in implicit and explicit memory,27 meaning that impairments in implicit memory tend to coincide with peak plasma levels of BZDs and do not last as long as the impairments in explicit memory. Impairments in explicit memory occur earlier (in reference to drug administration) and last longer than implicit memory impairments. Two hypotheses have aimed to explain this observation: (1) impairments in implicit memory require relatively higher drug levels in serum than explicit memory impairments, and (2) a specific type of BZD receptor is activated only at higher drug levels, making this receptor at least partly responsible for implicit memory impairments.27 Thus, BZDs impair long-term memory, more specifically, anterograde memory (amnesia for events occurring after the inciting event [drug absorption]). Currently no literature supports any significant evidence of BZDs causing retrograde amnesia (amnesia for events occurring before the inciting event). In the perioperative setting, BZDs are used specifically for their amnesic properties, but in nearly all other instances, amnesia is an undesired side effect. Although amnesia can occur in any patient, it is especially worrisome among the aging population, because age-related organ decline reduces the ability to metabolize and eliminate drugs, including BZDs. This problem can lead to toxic accumulation of BZDs and their breakdown products, the result of which may manifest in morbidity and even mortality. In many instances, a patient prescribed a BZD for an approved indication (such as anxiety, muscle spasms, or sleep disorders) in a dose that appears to be safe experiences severe memory loss or confusion after several doses. This effect occurs because many BZDs are relatively slowly eliminated from the body because of their lipophilic properties, and they accumulate in fatty tissues. As a result, a patient taking a typical standard dose may suffer significant memory loss. The patient may be unable to recognize loved ones and/or friends and may have difficulty remembering significant portions of his or her life, sometimes as much as several years. Cognitive impairment may also limit the patient's ability to work effectively as well. BZDs are commonly prescribed for a wide range of conditions, including use as sleep aides, muscle relaxants, and anxiolytics. However, dose-related side effects can be seen, including amnesia and central respiratory depression. Other drugs—including opioids, alcohol, and over-the-counter sleep aids—can have additive or synergistic effects on the central nervous system and respiratory function. Certain subpopulations of patients can have significant and severe BZD-mediated effects. The prudent clinician should weigh the risks and benefits of these agents before prescribing. (9, 2008) Use of benzodiazepines in the treatment of anxiety. Psychiatry (Edgmont) 5(9):21–22, pmid:19727256. (2011) Manchikanti L, Trescot AM, Christo PJ, et al, eds. Clinical Aspects of Pain Medicine and Interventional Pain Management: A Comprehensive Review, Antianxiety agents (ASIP Publishing; Paducah, KY) In, pp 543–552. (1, 2002) Role of the histidine residue at position 105 in the human alpha 5 containing GABA(A) receptor on the affinity and efficacy of benzodiazepine site ligands. Br J Pharmacol 135(1):248–256, pmid:11786501. (1, 1994) Pharmacology of benzodiazepine receptors: an update. J Psychiatry Neurosci 19(1):24–29, pmid:8148363. (10 21, 1999) Benzodiazepine actions mediated by specific gamma-aminobutyric acid(A) receptor subtypes. Nature 401(6755):796–800, pmid:10548105, Erratum in: Nature. 2000 Apr 6;404(6778):629. (2 21, 2003) Compartmentation of alpha 1 and alpha 2 GABA(A) receptor subunits within rat extended amygdala: implications for benzodiazepine action. Brain Res 964(1):91–99, pmid:12573516. (3, 2001) Molecular targets for the myorelaxant action of diazepam. Mol Pharmacol 59(3):442–445, pmid:11179437. (2001) A study of benzodiazepine users claiming drug-induced psychiatric morbidity. Nord J Psychiatry 55(4):271–278, pmid:11839118. (2012) in Moderate and Deep Sedation, Pharmacological agents in moderate and deep sedation, eds Urman RD, Kaye AD (Cambridge University Press; New York, NY) In, eds, pp 8–32. (1982) Alprazolam in the treatment of generalized anxiety and panic disorders: a double-blind placebo-controlled study. Psychopharmacology (Berl) 77(3):229–233, pmid:6126907. (4, 1983) Antimanic effect of clonazepam. Biol Psychiatry 18(4):451–466, pmid:6407539. (5, 2006) Clonazepam in the treatment of psychiatric disorders: an update. Int Clin Psychopharmacol 21(3):131–142, pmid:16528135. (1983) New concepts in benzodiazepine therapy: rebound anxiety and new indications for the more potent benzodiazepines. Prog Neuropsychopharmacol Biol Psychiatry 7((4-6)):669–673, pmid:6141609. (1, 1986) Acute treatment of manic agitation with lorazepam. Psychosomatics 27((1 Suppl)):28–32, pmid:3952252. (4, 1985) Inpatient clinical trial of lorazepam for the management of manic agitation. J Clin Psychopharmacol 5(2):109–113, pmid:3988969. (2008) Midazolam and other benzodiazepines. Handb Exp Pharmacol (182):335–360, pmid:18175099. (3, 1985) Midazolam: pharmacology and uses. Anesthesiology 62(3):310–324, pmid:3156545. (1983) Preclinical pharmacology of midazolam. Br J Clin Pharmacol 16((Suppl 1)):17S–27S, pmid:6138073. (1983) Chemical structure and properties of midazolam compared with other benzodiazepines. Br J Clin Pharmacol 16((Suppl 1)):11S–16S, pmid:6138062. (May-Jun 1987) Midazolam: a new drug for intravenous sedation. Anesth Prog 34(3):87–89, pmid:3318566. (12, 1981) Time course of antirecall effect of diazepam and lorazepam following oral administration. Anesthesiology 55(6):641–644, pmid:6118078. (7 28, 2004) Requirement of alpha5-GABAA receptors for the development of tolerance to the sedative action of diazepam in mice. J Neurosci 24(30):6785–6790, pmid:15282283. (8, 1985) Aging in the nervous system. Neurosurgery 17(2):348–354, pmid:3897893. (Nov-Dec 1987) Neuron numbers and dendritic extent in normal aging and Alzheimer's disease. Neurobiol Aging 8(6):521–545, pmid:3323927. (1993) in Principles and Practice of Anesthesiology, Evaluations of the geriatric patient, eds MC Rogers, Covino BG, Tinker JH (Mosby Year Book; St. Louis, MO) In, eds, pp 480–492. (12, 2003) Trends in the prescription of inappropriate drugs for the elderly between 1995 and 1999. Am J Geriatr Pharmacother 1(2):61–74, pmid:15555468. (2002) Cognitive and sedative effects of benzodiazepine use. Curr Pharm Des 8(1):45–58, pmid:11812249. (2005) Estimate of the incidence of drug-facilitated sexual assault in the U.S. Final Report, Washington, DC, https://www.ncjrs.gov/pdffiles1/nij/grants/212000.pdf. Accessed March 5, 2013. (1, 2006) A case of drug-facilitated sexual assault by the use of flunitrazepam. J Clin Forensic Med 13(1):44–45, pmid:16087387, Epub 2005 Aug 8. (4, 1998) Benzodiazepine use and motor vehicle accidents. Systematic review of reported association. Can Fam Physician 44:799–808, pmid:9585853. (6, 2005) Is it safe to drive a car when treated with anxiolytics? Evidence from on-the-road driving studies during normal traffic. Curr Psychiatry Rev 1(2):215–225. (1, 2009) Benzodiazepine and opioid use and the duration of intensive care unit delirium in an older population. Crit Care Med 37(1):177–183, pmid:19050611. (12 5, 2001) Delirium in mechanically ventilated patients: validity and reliability of the confusion assessment method for the intensive care unit (CAM-ICU). JAMA 286(21):2703–2710, pmid:11730446. (5, 2003) Delirium in the intensive care unit: occurrence and clinical course in older patients. J Am Geriatr Soc 51(5):591–598, pmid:12752832. (5, 2001) Intensive Care Delirium Screening Checklist: evaluation of a new screening tool. Intensive Care Med 27(5):859–864, pmid:11430542. (2006) A research algorithm to improve detection of delirium in the intensive care unit. Crit Care 10(4):R121, pmid:16919169. (2007) Delirium in older patients in surgical intensive care units. J Nurs Scholarsh 39(2):147–154, pmid:17535315. (8 13-27, 2007) Characteristics associated with delirium in older patients in a medical intensive care unit. Arch Intern Med 167(15):1629–1634, pmid:17698685.